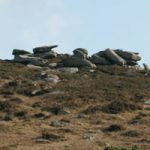 In the 1860s, when many copper mines were closing, a ‘lode’ of tin ore was discovered to the South of Carn Brea in an area that previously worked copper deposits. This lode, over 2 miles long, was also flatter than most, lying at an angle of about 30 degrees instead of the usual 70 degrees from the horizontal – hence its name, the “Great Flat Lode”. The tin mines here were some of the most successful in the late 19th Century and produced over 90,000 tons of tin concentrate. The mines here closed about 1920. Since then the area has remained relatively undeveloped and it now contains some of Cornwall’s finest remains of engine houses, tin dressing floors and other mining structures. The Trail not only runs south of Carn Brea, but also to the north of the hill, where some of Cornwall’s most celebrated mines are situated. Nature of trail: A circular route with some steep sections. Mostly off-road taking you through a mixture of farmland, heathland and old mine sites. A circular route. Where to park: South Wheal Frances, Dolcoath Mine and at King Edward Mine Museum (where you can visit a free exhibition all about the Mineral Tramways). Points of interest: The Great Flat Lode Trail follows part of the line of the Basset Mine Tramway, built to carry tin ore from the mines along the side of the valley for processing at Wheal Basset Stamps. The remains of Cornwall’s last tin smelter can be visited near Carnkie. 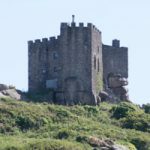 Carn Brea, once an ancient fortified hill settlement can be climbed for superb panoramic views which will include the tall steel headgear of South Crofty, Cornwall’s last tin mine. Parking – Parking at South Wheal Frances car park. Eating and shopping – there is no shop on the route. Public houses – no pubs on the route. Disability access – only if you have a good strong scooter with the battery length. 12th Century. Whitcross is probably a corruption of ‘White Cross’. The field directly behind the cross was named ‘Cross Field’ on the 1840 Tithe Apportionment Map. There are five villages in Cornwall called Whitecross but only two still have their white cross, also there are about 30 crosses which are painted white and known as White crosses. It is not known why they were painted white. 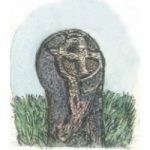 Wayside crosses in Cornwall are mainly 12th Century and would have been set up when the parochial system was being established. There is also a Celtic cross at Forest. Private property. In operation in 1895 and shown on the 1907 OS map. Well preserved examples of convex and concave buddles, slime tanks and tailings channels. Private property. It was probably from this quarry that the 100,000 cubic feet/2832 cubic metres of granite was taken in 1824 for the extension to the pier head of Portreath harbour. Private property. Allegedly dates from Norman times and was used as a hunting lodge by the Bassets for the deer park. The monument is 90ft/27.5m high and 738ft/225m above sea level, it is inscribed ‘The County of Cornwall to the memory of Francis Lord de Dunstanville and Basset A.D. 1836’. Situated on the eastern summit. This is the earliest known village in Britain and was inhabited around 3,000 BC possibly even 6,000 BC. There was a settlement of 150 to 200 people in rectangular wooden huts, surrounded by massive stone ramparts forming part of the same system as the other ramparts and enclosure on the western summit. The huts have been carbon dated to between 3109 and 2687 BC, which would make this settlement the oldest known in Britain. 700 or more arrowheads were recovered during the 1970-73 excavations, indicating an attack in the Neolithic period and providing some of the earliest evidence of armed conflict.